Sometimes I think this love of pests started with pigeons, because pigeons are simply doves on steroids, and it’s fascinating to me that doves are in the same bird family, but doves are seen as religiously good in our culture, while pigeons are seen as a nuisance. There is also the fact that the modern city pigeon, a transplant, is actually feral livestock brought over by European colonists as a food source in the 1600s. The modern city pigeon, so much pest now, could be tomorrow’s passenger pigeon, and hundreds of years from now, nature-minded people may read contemporary peoples’ accounts of cities covered in pigeons with the same bittersweet feelings of sadness and pained nostalgia that I feel when I read about flocks of hundreds of millions of passenger pigeons in the 1800s. There is also the fact that pigeons can be pretty interesting if you watch them. They have iridescent feathers in turquoise and violet along their necks, and a male displays them to a female during their courtship display. I once witnessed this in grave fascination outside a bus station in downtown Denver. It was surprisingly compelling to watch, and the fact that it was happening in an urban landscape like downtown Denver made it no less fascinating than if it had been happening out in the wilderness. Another time, walking along the streets of Boulder all littered with magpies flashing white and black and the dusty creak of ravens carrying over, I looked down and saw a ripped-off pigeon head on the sidewalk before me. The prevalence of foxes, coyotes, and other predators made coming across random parts or partially eaten remains of animals fairly likely in Boulder, and I only stooped down to discern what kind of animal had eaten the rest of the pigeon while the sun glinted off the aqua neck feathers like a sea-worthy jewel. So much so that I found myself lost in the beauty of the iridescent feathers as they trulled slightly in the wind. I must have gazed at the head for 10 or 15 minutes (a short time to gaze at anything compelling really). After that, I decided that pigeons were quite pretty birds no matter what people said about them. And when I see them in a landscape now I always like them. I always feel a good, uplifting feeling from them. I think this is true of anything, really, that we get to know. This is true in part, but other times I think this admiration for pests started with flies. Like anyone else with some sense, I hate flies. I hate them and kill them in all of their forms. But I had this experience with a fly that was really moving. Anyway, I was reading The Odyssey in my attic apartment, and there were three flies. They had gotten in the Friday before when I left a window open one evening, and they were attracted to the glaring light of my kitchen. As the days droned on that week, first one, then another succumbed to my fly swatter. But one did not die. I tried to kill it, but I was not fast enough. Finally, I had it in my tiny bathroom with the door shut, and we made tight circles as it landed on one, then another surface as I chased after it, lumbering behind it like a recalcitrant mule, swatter in hand. And as we circled my bathroom, I started thinking about The Odyssey. After all, isn’t flying into a kitchen because of one light burning a kind of fly odyssey? And didn’t this make the fly like Odysseus? And if the fly is Odysseus, then what was I? I started thinking about Polyphemus, the cyclops who trapped Odysseus and his men in his cave instead of offering them hospitality, and then slowly killed and ate some of them. I had trapped the fly in a bathroom, and now I was chasing it around the way Polyphemus did with Odysseus and his men. The flyswatter flicked out and caught the fly resting on the overhanging door jamb, splitting it in half. The bottom half of the fly lay hanging from the door jamb with several millimeters of digestive tract trailing out, while on the floor below, the top half of the fly twitched and writhed weakly. It was monstrous, and I was the monster. I felt ill and laid down in my bed and stared at the wall. But the moment was not without beauty. It was not without a poignancy of feeling that beauty gives us. Becuase it is beauty that ruins things for us, or at least ruins our dislike for us. And once you have an aesthetic experience with something that you feel should be unlikable, is is not just less unlikable in the process, but you are more likely to keep having these aesthetic experiences. It is hard to hate something — or at least fail to see the value of something — if you’ve witnessed it in some way that is in any way aesthetic. And so the fly experiences kept happening. Not long after that, I saw a maggot-filled deer that caught the light like a glittering diamond, and it was beautiful. 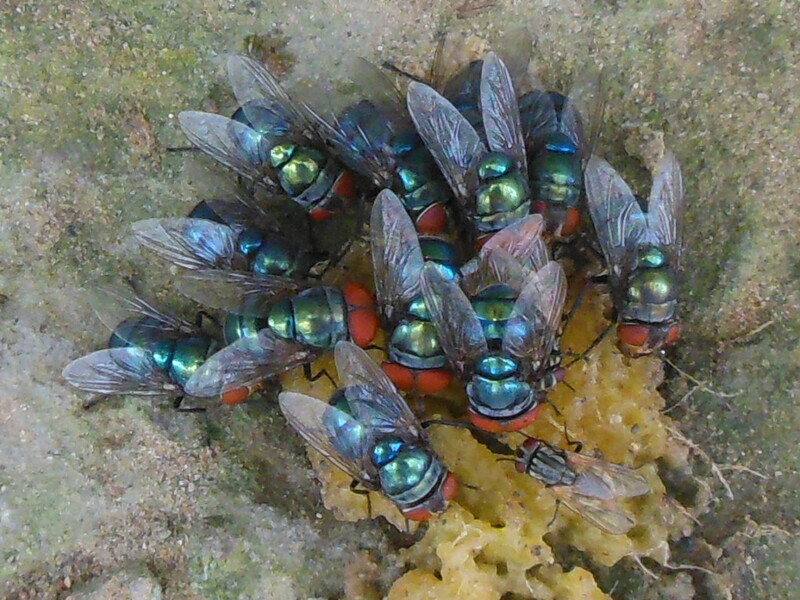 Just recently, I vacuumed up a hundred house flies that writhed around in the vacuum canister like a hundred glittering emeralds. The flies in the vacuum were all, all beautiful. I loved watching them. Why not find value in this, too, if you are going to find value in anything? It’s so much easier to find a flower pretty. Society already dictates that we feel this way. But the weird or the ugly or the pests, seeing beauty in that that takes work. A complete unanimity of feeling. And when it happens, it is like a sort of perfection descends over you. Here was this beauty staring you in the face, and you only just noticed. Perhaps it is a little bit also like falling in love. Love your life, poor as it is. You may perhaps have some pleasant, thrilling, glorious hours, even in a poor-house. The setting sun is reflected from the windows of the alms-house as brightly as from the rich man’s abode; the snow melts before its door as early in the spring. When its comes to pests, it’s a little like this. Pests are that sunset in the almshouse. Even the meanest, most fragile things are still beautiful if you look at them long enough.